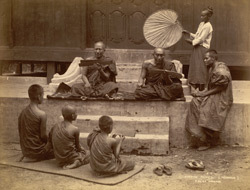 Photograph of Burmese Buddhist monks (pongyis), taken by Philip Adolphe Klier in the 1890s. This view shows a class in progress in a Burmese monastery. Two older monks, seated on a stone platform, read from palm leaf books while their pupils, young novitiates, are seated below them on a mat. A servant girl standing in the background fans the monks. Theravada Buddhism is the state religion of Burma. It became established during the reign of King Anawrahta in the 11th century. In the 19th century the monastery was the focal point of a community and traditionally also the centre of education. It is still a rite of passage for every Burmese boy to spend a period of time living as a novice in a monastery.